One of the coolest things I have learned in all of my teacher training has got to be Brainies! At the Whole Brain Teaching Conference this summer Chris Biffle introduced this new strategy to us, and I am IN LOVE! 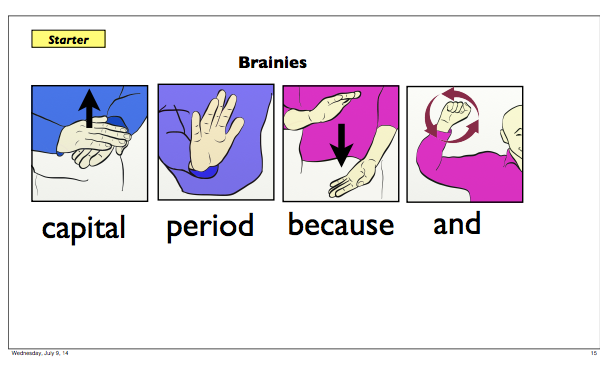 The idea is to teach your students these Brainies and their corresponding hand gestures a little at a time. Then throughout the year students should use Brainies with their speaking while the rest of the class uses mirrors with them too. I started off by teaching my students the "capital letter", "period", "and", and "because". Here are the hand motions for these Brainies. Once your kiddos get really good at Brainies you can begin to teach more. You will find that Chris Biffle has assigned a point value to each Brainie. 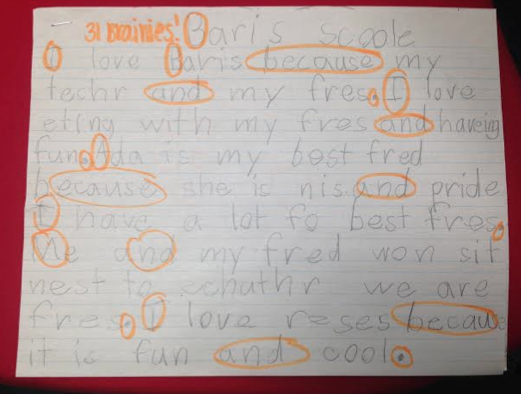 Students can then work on earning points by using different Brainies in their paper. During my first use of Brainies in the classroom, I simply walked around the room with highlighters and circled anytime I saw a student using a Brainie correctly. I then took the papers home, totaled each paper for number of Brainies. 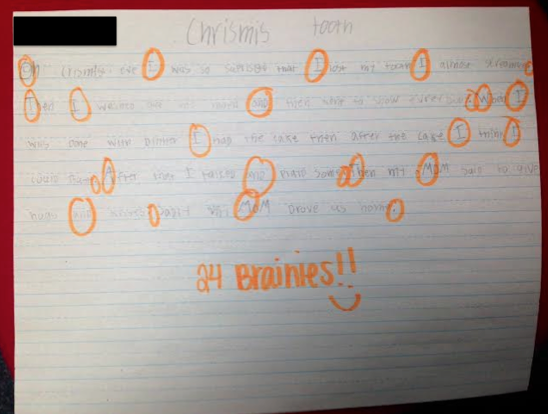 The next day, we reviewed Brainies and each student had to beat their total by at least one more Brainie. The results were outstanding! This student used 16 Brainies on her first try. The second day, she was able to use 31 Brainies in one story! Also, please remember this is only the 6th day of school! I love Barretts school because of my teachers and my friends. I love eating with my friends and having fun. Ada is my best friend because she is nice and pretty. I have a lot of best friends. Me and my friends would sit next to each other we are friends. I love recess because it is fun and cool. I hope you like my story and my friends. I hope you have great friends too. I hope this book inspires you. My teacher is amazing and cool. This next story is fantastic too! On this day the students had about 15 minutes to just write and use Brainies. We did not talk about anything related to writing other than the 4 Brainies I had taught them in our mini-lesson. On Christmas Eve I was so surprised that I lost my tooth I almost screamed. Then I washed out my mouth and then went to show everybody. When I was done with dinner I had the cake then after the cake I think I could burst. After that I talked and played some. Then my Mom said to give hugs and kisses. Sadly my Mom drove us home. 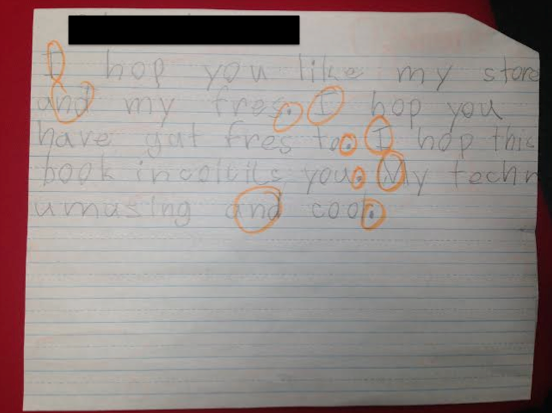 I found that my students responded really well to the immediate feedback as they were writing. As I would circle or highlight their Brainies I found that it encouraged them to use even more. 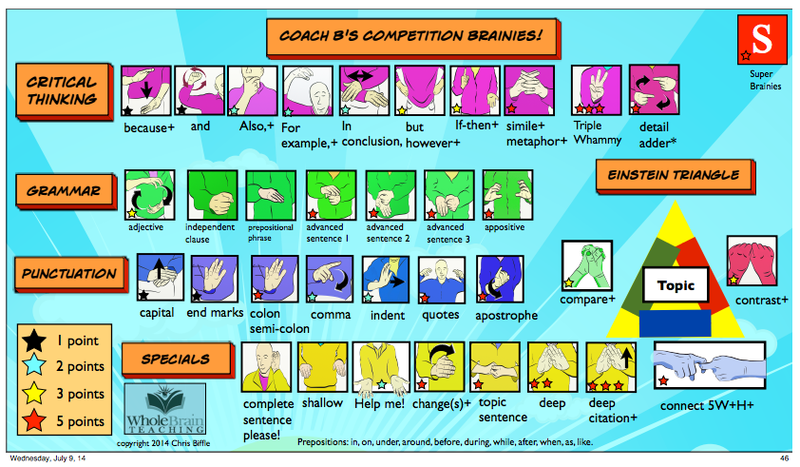 As we progress through the year we will add more Brainies and more rules for Brainies, such as you can't start sentences with certain Brainies or you will only get points for the first time you use a Brainie to encourage students to use a variety of Brainies in their writing. Give Brainies a try in your classroom and let me know how it goes! I'd love to see what your students can write. Dabbling in Differentiation has nominated you for the Liebster Award. Please go to my blogspot to check out the details of the nomination.